Transformation, client-agency relationships, crisis communications and talent concerns come to the fore at the first PR Trends event in Moscow. PR Trends 2016 took place earlier this week in Moscow, organized by Buman Media in collaboration with The Holmes Report. The conference focused on the changes in Russia's PR industry and was divided into six sessions, focusing on such dimensions as communications transformation, creativity in PR, Russian market data, talent development and crisis communications. Accordingly, here are the key learnings from the six themes discussed at PR Trends 2016. The first session, headed by Paul Holmes, covered the most important changes in the sphere of PR in Russia and abroad. Holmes explored the modernisation of PR amid industry changes towards digital and social media. In the situation of limited budgets there appeared a requirement to generate high-quality photo- and video-content as quickly as possible. In addition Paul listed the most important qualities PR specialists should obtain, among them are: courage, empathy and curiosity. He also stressed that today the importance of analytical skills increased greatly and there should even be a special person, chief data officer, in every company. Moreover, nowadays PR is no longer focused on what the company says but on how it behaves, how it acts. And PR specialists in the company are no longer just ‘talking heads’, they turn to be decision-makers. Natalia Bucelnikova, managing director of Buman Media, described the realities of the Russian PR market. 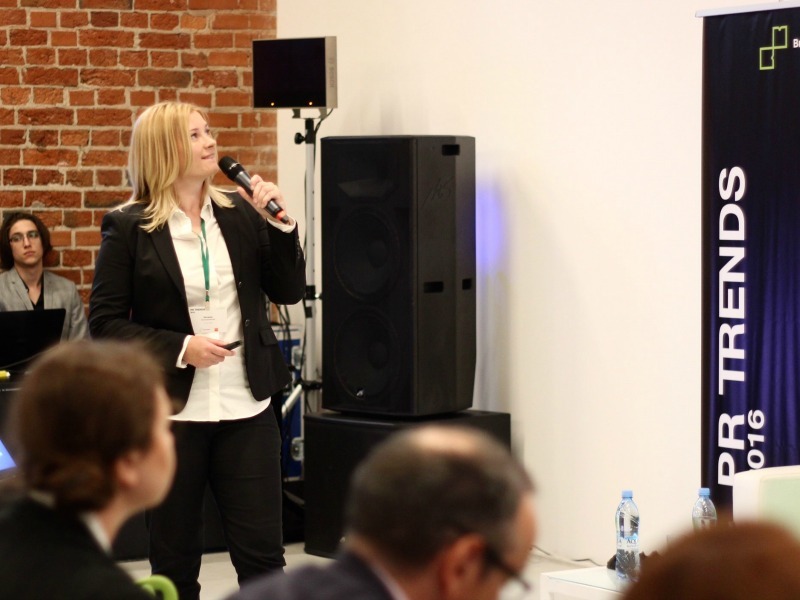 She presented the results of the survey, conducted by Buman Media in collaboration with leading online recruitment portal HeadHunter, among 110 PR and marketing directors to find out how the Russian PR market is changing. According to the survey, PR budgets in Russia this year, compared with the past, have become more modest. Today the most common PR budget ranges from 2 to 7 million rubles and 25% of the companies can afford it. The PR budget of more than 7 million rubles is only 20% of companies. Bucelnikova also talked about the requirements for PR agencies - today, the most popular skills requested by clients are analytical skills — 45% of respondents noted that. But the most interesting thing was that this year, the lack of creativity was only noted by 22% of respondents. Last year this skill was requested by 77% of respondents. In addition, Bucelnikova discussed the most important the most effective communication channels among which this year were: online media (57%), social networks (52%) and special events (28%). Last but not the least was analysis of the key activities for PR departments this year. According to the survey, majority of respondents named promotion in social networks as the most important PR activity. Second place was shared between the engagement with negative comments and anti-crisis PR, as well as securing the brand presence in top quoting ratings by the media. In third place was the brand re-positioning. Olga Podoinitsina, member of the board of VTB Capital, talked about the transformation of PR and the market. She also stressed that today PR specialists have to work with really huge amount of information. She said that three things have changed in the market: the amount of information has increased, the speed of decision-making has accelerated and the audience itself also has changed – now it has so-called mosaic thinking. And every PR-professional should take this into account. But most of Podoinitsina's presentation was devoted to the task of presenting the company in external markets. She talked about the perception of Russia and Russian business by foreigners, as well as about the obstacles and stereotypes impacting their promotion in foreign markets and these can be overcome A good example of how to use certain stereotypes for the benefit of the company: VTB Capital organized an exhibition of Russian painting in Singapore, birch trees in the paintings were exotic for the audience and attracted their attention. In Podoinitsyna's words, if a company wants to promote itself in other countries, it is highly important to understand how the company's native country is perceived internationally. In this session, experts discussed the necessity of creativity in the work of PR specialists. They also discussed the trend towards less creative demands being made of PR agencies and covered some bright and successful creative cases in the Russian market. The speakers came to the conclusion that nowadays the B2B and B2C segments merge with each other and communication becomes similar to the format P2P (people to people). All in all according to the participants of the session creativity (any smart, fresh and unusual idea) can be used only once, and it’s hard to standardize it. There also exists some sort of cognitive dissonance regarding the channels of communications (especially within social networks) — PR specialists use certain social networks and think that the whole audience is located there. Yet it’s interesting that, for example, in Russia the most popular channels of communication are foreign ones: Instagram, What's up, Facebook etc. On the other hand, for example, in Kazakhstan, Russian social networks are more popular, among them are: ‘My world’ and ‘Classmates’. So it is important to analyze where your audience is located. During this session specialists talked about the relations between PR agencies and corporate PR departments: what activities should be assigned to the PR agency and what should be handled in-house? Among the agency activities are: monotonous, routine work that shouldn’t be done by in-house staff; new insights & creativity, as well as crisis communications (company staff is often too emotional during the crisis, and the agency can provide the company with the third-party vision of the situation). The speakers also discussed KPIs – what they are and how they should be measured and formed, as well as global best practice. Experts discussed a wide range of issues related to the most effective channels of communications, newsbreaks and how to deal with them. Also explored were problems relating to the existing KPIs for PR specialists. The conclusion arrived at was that nowadays the number of articles and publications doesn’t matter. It doesn’t matter how many publications came out after distributing a press release, the only thing that is important is to reach the company’s audience. In this case it is not highly important to be covered only by top media outlets but to be published in the media outlets where the company’s audience is located. While talking about the staff in the PR industry, participants talked about modern PR specialists: their skills and abilities, as well as relations between PR agencies and in-house PR departments. According to the participants of this session, PR agencies should run the PR issues of those companies that have no local PR specialists in the region or have some temporary activities that PR agencies can help them with. They stressed that nowadays it’s highly important to have the ability to work with big data, and also stressed the importance of creating the brand narrative. The speakers also discussed the situation in Russia. According to them one of the most important qualities of PR experts today is the ability to work with huge amount of information, analyze it carefully and develop further ideas and solutions. Unfortunately, nowadays there is a shortage of such skills and specialists in the Russian market. And practitioners have no understanding of how they should develop these skills. There are also problems surrounding PR fees, especially regarding the salaries of agency staff. According to Andy West, group chief development officer at Hotwire PR, nowadays PR specialists have lots of opportunities to develop their talents in so many directions, but there are also several limiting factors: education, attitudes towards the profession, the reasons they have entered the industry. The industry still suffers from an old image of partying with champagne. But PR managers need to attract a new generation of PR-practitioners for the right reasons – in the same way they would choose a career in management consulting or investment banking. During the session the speakers discussed the role of PR in crisis management. According to speakers in this session, on average, companies face serious crisis situations every five years, and the recovery from it takes about three years. In this case the role of PR specialists is highly important and it’s important for the company to manage the information flow and be as transparent as possible. The speakers also stressed that it’s important to combine PR and government relations during the crisis situation. The experts highlighted that it is important to start managing the crisis from communicating with staff and explaining the developing situation before going to outside audiences. The event was backed by numerous partners: RASO (Russian Association of Public Relations); leading online recruitment portal HeadHunter; professional web development Eastwood; N1 social media monitoring system Youscan, Mediabitch, special PR media outlet and Grayling, worldwide public relations firm.